Why is this font still included in word processing software released after 2000? I use Microsoft Word 2007. What is it doing in the drop down list? I choose to believe that it is a programming glitch. 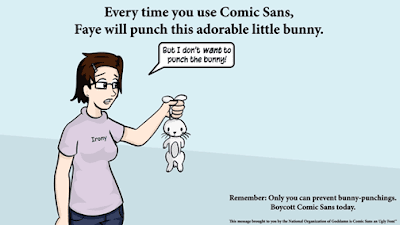 They intended to remove Comic Sans as an option, but it slipped through the cracks somehow. It is a slippery little font. At least I know that I am not alone. I get a Redbox code every Monday for the free DVD rental. Unsurprisingly, the high quality movies are few and far between. But, did I mention these crappy movies are available for F-R-E-E? How can I pass that up? The consequences for such a rental are pretty minor. I hate the movie and shut it off. I waste 1.5 - 2 hours watching a bad movie. And the worst possible outcome: I return it after 9 p.m. tomorrow night and have to pay $1. I figured I would take the chance. I know, I know, I am quite the risk taker. You should probably warn your mom about me. Today the primo choice available was My Best Friend's Girl, starting Dane Cook, Kate Hudson and Jason Biggs. The key to enjoying these movies is to completely lower your standards. If you have zero to no expectations, it is hard to be disappointed. As expected, MBFG was pretty craptastic. On a scale of 1 to 5 with 1 being Freddy Got Fingered and The Godfather being 5, I give it a 3. Which means, it met all my expectations of being offensive, predicatable and (at times) relatively amusing. I am embarrassed to say that I laughed a couple times (don't tell anyone!). I liked most of the songs in the movie: 99 Red Ballons, Mercy, Crimson and Clover, The Man Comes Around (who doesn't love Johnny Cash? ), At Last, Have a Little Faith in Me and My Best Friend's Girl. The fun soundtrack was probably the best part of the movie! It made me laugh. I would like to thank my low expectations for this. Dane Cook is a terrible actor. Is anyone surprised by this observation? I think not. They have a loud smack talk showdown in the middle of a restaurant. What was Alec Baldwin doing in this movie? I love quotes and I find this one to be particularly motivating. Big goals and aspirations seem like a lot of things, but doable isn't always one of them. They can be completely overwhelming. Unconscionable. Lots of -able words that don't happen to be synonyms with attainable. And they are...if you don't ever try. Trying isn't doing a lot of talking and thinking these goals. Trying is an action word that means that you actually do something about it. Taking steps that will actually move you closed to the desired outcome. Yoda was a wise little Muppet. Make a plan to accomplish your goals, but don't just think about them. Write them down. Get started! The first step can be the hardest. Work towards your goal and it will be yours!